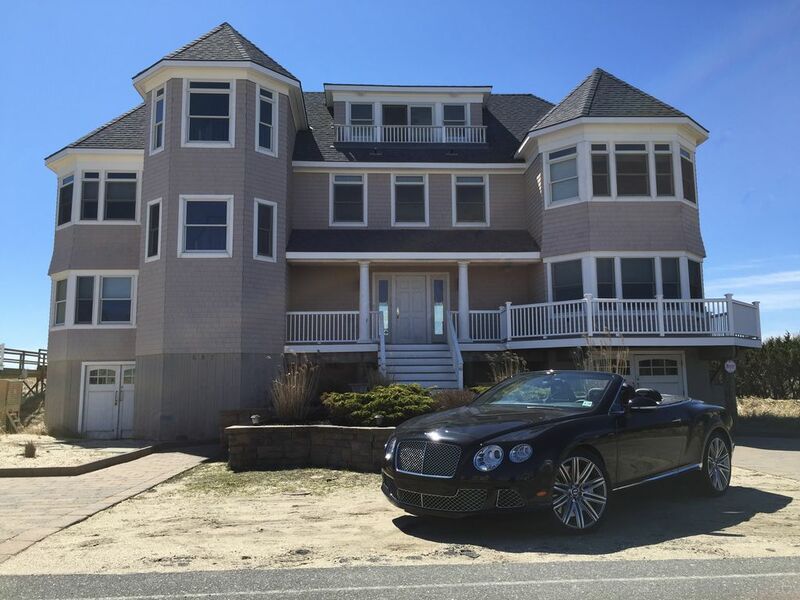 Rock-star type oceanfront beach house, with endless luxury amenities, in West Hampton Dunes, LI. New construction on nearly 90 feet of oceanfront on prestigious Dune Road (the 600 block, close to the bridge & town, far from public beaches), nearly 5000 ft2. Always quick to be reserved. Luxurious vacation rental at your Happy Place ! Savvy Hamptons travelers head for West Hampton Dunes: family oriented, laid back atmosphere, the closest Hampton (least traffic), & the very best sugar white beaches. More exclusive & private close to the WHB Bridge (further East) - closer to town, no public beaches. Only homeowners or our guests can access our stretch of beach - there are only private (no public) walkways. Front of house has gorgeous views of Moriches Bay; back of house faces directly to ocean. Front of house has gorgeous views of Moriches Bay; back of house faces directly to ocean. Access rights to Moriches Bay across the street for water activities. Spectacular 360 degree water (ocean + bay) views throughout. Sightlines are fabulous throughout; main living space on 2nd floor ensures you see the beach above the dune line. We love our guests ! – check out our indispensable Welcome website that walks you through the house amenities, village rules, local guides, links, useful apps, incredible videos & 360 degree photo panoramas, & much more. Not just for Rock Stars ! TV & Movie Stars Too. Everyone is a Rock / Movie Star when staying at Dune Road Rental ! House featured for 30 minutes on international Reality TV show ‘Whats for Sale? With a View.’ A major Hollywood Studio (Warner Bros. TV [R]) requested to use photos of the house for their hit show 'The Closer [R].' NBC Universal Studios [R] inquired about filming an episode of the acclaimed TV show 'Royal Pains [R].' have hosted / fielded inquiries from management of numerous rap / movie stars / rock & rock hall famers to stay or shoot videos / reality TV episodes. Scouted for movies starring Scarlett Johansson & Paul Reiser. An Academy Award [R] winning Best Supporting Actress recently enjoyed her vacation at the house. Have hosted Titans of Technology. Fully loaded luxury “rock star” beach house: 3 levels, 2 full decks + 2 mini decks on each side of the loft / 3rd level. Expansive belgian block driveway fits several cars, as well as 2 car covered garage. Central a/c, central vac, numerous flat screen TV's, full bath with each of 8 bedrooms (+ two 1/2 bath guest baths).On the first floor we have 4 bedrooms, 3 have queen beds the other one has 2 double beds, all have their own private bathroom. On the second floor we have 2 master suites with spa bathrooms. On the third floor we have 2 more bedrooms and that share a bathroom. Beautiful second living room on the third floor with incredible views. Heated and lit gunite pool; top-line 4-adult spa / jacuzzi for year round use (covered by 2nd floor deck); extensive new outdoor furniture. Dual master suites on 2nd floor flanking living and kitchen area that have spectacular wall to wall beach and bay views at a favorable sightline elevation; 2nd floor living room with wall to wall beach & bay views. Daytime loft play area for kids with TV / DVD / Apple TV / Chromecast / Sonos music. Fabulous ocean views and sea breeze while you dine at either the dinner table or center island / bar stools. Gold level Security / Fire / power outage / water / temperature Alarm systems (protection even in power failure), heated pipes, motion sensor LED floodlights impervious to power outages, front door motion cam with phone notifications available, fabulous local police/constable with exceptional security. The utmost in fine beach living + comforts of home: Fully stocked kitchen (including Viking wine refrigerator, Viking range, Keurig as well as standard coffee maker, 2 Bosch dishwashers), each master suite with an extra large bathroom complex, including vessel sinks as well as double onyx-lined showers (one for each master suite) with multiple heads and body jets: a resort experience at every level. Propane Weber grill on 2nd floor deck; separate deck on ground floor, partly covered and with blue gunite heated & lit pool. Gorgeous gas fireplace in living room. Private walkway (with solar lighting) over the sand dunes to the beach, outdoor shower. Childproof pool fencing available. Vineyards/Wine Tasting, Bicycling & Walking on Dune Road (3 miles each way to either the Westhampton Bridge or the western tip of the island (Cupsogue Park); Snowshoeing on the beach year round ! (2 snowshoes in the garage + 2 bicycles & helmets), Jacuzzi (all weather - covered by deck), Sauna, Live Music, Antiquing, Estate Sales, Shopping/Tanger Outlets, Farmers Markets, Aquarium, drive to Montauk, Fishing, No summertime Traffic! property owner is very proud of this majestic property, ultra-responsive to tenants and their inquiries; caring, helpful, and friendly, with laser-like focus on detail and service. gets the deal & the job done! local property manager also provides expert & timely on-the-ground assistance, as well as our contractors. Dune Road Rental guest service is as incredible as the home itself. our large number of 5 star reviews speak for themselves ! 3 miles from bridge to Westhampton Beach; downtown another mile away. quaint Main St., Farmer's Market, Performing Arts Center, restaurants & shopping, movie theater. Apple TVs / Chromecasts can mirror your game apps on TV ! all the music in the world available on Sonos ! endless internet radio, your phone music, YouTube audio... Apple TVs can play all your music & music videos on TV ! now with Alexa Voice Control ! double deck ! outdoor speakers / music! am a repeat guest at this fabulous beach home. the owner & manager are incredibly friendly, helpful, informative, & respond immediately. clean and maintained perfectly with amazing array of amenities and audiovisual gizmos - even house Netflix & Hulu accounts to binge watch on the apple tv's ! perfect winter getaway; we have had an awesome time during prior summer stays but this was a restful and restorative winter weekend at this incredible beach home. hamptons in the winter very laid back, a quick 2 hr drive from manhattan. all our friends know about this rental we rave about & a few have rented themselves ! tremendous & luxurious beach home. the best on dune road and we have stayed at many home in the hamptons. this one was by far the best managed, best appointed, and best time of all for our family and friends. jill is a joy to work with, and vinny is extremely accessible and welcomed us personally upon arrival. he even arranged for a chef and a fishing boat captain. clean home, everything we could want - house is uncluttered but has all the beach and kitchen necessities so all we had to bring was toothbrush. the views are stunning from all bedrooms; the master bedroom suites felt like a ritz carlton resort suite; the master bathrooms had spa features. very close to town, easy to go shopping, the closest hampton to NYC. we have recommended this property to many contacts, some of whom have already enjoyed their own stays at this amazing beach house ! THE BEST SUMMER VACATION EVER AT THIS HOUSE ! enjoyed 2 glorious summer vacation weeks at this tremendous property. we are seasoned world travelers and know Dune Road and the Hamptons very well. this is the best vacation home we have stayed at, and the professionalism, amenities, and layout are top notch. the location is beyond perfect - ocean side of Dune Road, not too far away from the bridge to Westhampton Beach. the ocean feels completely private and is never crowded. plenty of room & bedrooms and we love having the main living space on the 2nd floor with commanding views of both the ocean & bay. We had an amazing time ! The owner Jill was great and very helpful, so was her house manager! I need a very clean environment , and this house did not disappoint ! The views are excellent, we took some outstanding pictures from the outdoor deck over looking the water.The showers are great , we nick named them " the car wash". This home would make a great vacation for anyone ! Amazing house for getaways with friends!!! Everything was great! Spectacular house, tons of space, stunning view! Jill and Vinny where very helpful and hospital! We had a very good time there! All the friends were happy and excited! The house is great -- just look at the photos! -- proximity to the beach was great for morning walks/jogs; Also, the renter (Jill) and her property manager (Vinny) are both very good to work with! Both prompt and thorough in responses -- and Vinny went above and beyond for our group; he stayed at the house to wait for our grocery delivery (which arrived before we did) and he even went ahead and put everything away, so we arrived to a stocked fridge to start our weekend. Just amazing -- I recommend this house! Nominally a public beach, but town bans all parking on Dune Road, so that the beach is essentially private - neighbors will be the only beach goers you will likely ever see. 360 degree water views (ocean + bay) everywhere. Sightlines are fabulous throughout. Local area features world class beaches, dining/entertainment, shopping, golf, tennis, watersports, wineries, too much to list. **********************PROPERTY IS ALSO AVAILABLE FOR MONTHLY / SEASONAL RENTAL********************* rates can change at any time, are estimates only & dependent on market conditions NEGOTIABLE ! Last minute & Holiday specials as well !!! Cancelled bookings will not receive a refund. All rates exclude holidays, corporate events, special occasions, and any parties or functions. Until confirmed and rental agreement is executed in full, rates are subject to change. Daily rates based on weekday stay. HAMPTONS WINTER WONDERLAND SPECIALS - HOLIDAY HEAVEN ! Christmas Week still available ! Winter getaways for Oceanside peace & quiet. Rentals of more than 30 days not subject to 3% county tax. This house is not available for rent or listed by owner on Craigslist. Copy of Drivers License required at time of Lease signing.